I received the following description from Commissioner Michele Madigan regarding the city’s computerized accounting system with a focus on payroll. To an unsophisticated person like myself, their statements would make me believe that the city not only has no automated payroll functions but has no plans to address the lack of such accounting tools. As someone who is a computer programmer and has worked on deployments involving payroll and time recording I can assure the readers of this blog that it is far, far more complex than one would assume. I would like to invite any members of the Charter Review Commission to submit a guest post to respond to Commissioner Madigan’s description of how payroll is done currently in the city. It would be helpful if their response were as specific and detailed as possible explaining what is antiquated about the current system and what system they have in mind that would save the city at least $500,000. According to Section 4.3.1 of the current City Charter: “Accounting Systems: The Commissioner of Finance shall maintain and supervise the general accounting system for the City government and each of its offices, departments and entities in accordance with the uniform system of accounts prescribed by the State Comptroller…” As a result: The City of Saratoga Springs utilizes one of the most sophisticated financial management and accounting systems available on the market today – MUNIS – from Tyler Technologies has expertise in Financials, Revenue, Payroll &amp; HR, Citizen Services, and Human Capital Management. We are not antiquated, far from it; we have integrated MUNIS software modules into a structured departmental system that centralizes in the City Finance Office. We utilize state of the art technology to streamline all the various nuances of our 7 separate Union Contracts and our Non-Union Employee Contract – ensuring compliance within those individual contracts along with various Finance Policies and Procedures (as required under the current Charter and Commission Government Section 4.2.1 Finance Policy and Procedures Manual). The City utilizes MUNIS Payroll functionality to manage Contract Improvements, Step and Longevity Increases, Accrual allotment and charges, and Employee Deductions (Health Insurance, Deferred Compensation, NYS Retirement Contributions, etc). At the same time we are interfacing Payroll Cost Accounting into our General Ledger every time we post a payroll. In addition the City uses MUNIS modules for Online Tax and Utility Billing, Tax Collections, Accounts Payable, Building Permits and Purchasing. It’s a sophisticated system. Additionally, the Finance Department is in the process of implementing a Time and Attendance system module. Roll-out of the system has occurred in DPW and within our Police Department. This project will take approximately 2 years from start to finish and included a detailed review by committee with representation from each department. System implementations are expensive and take time. We have invested years in our state-of-the-art MUNIS system. I’ve grown tired of the misinformation being peddled by members of the Charter Review Commission. Vote yes or no to change the form of government, but please let’s have an honest assessment of this proposal and the costs associated with this new hybrid form of government (City Manager w/ a Strong Mayor). Commissioner of Finance Michele Madigan has written the following analysis of costs associated with the proposed charter. The charter which would change the Saratoga Springs city government from the current commission form to a city manager form will be on the ballot on November 7. Saratoga Springs voters will decide if we should change our form of government via the adoption of a new Charter this November. Our current commission form of government works extremely well for small cities, is quite democratic, and is often compared to parliamentary systems. Some medium-sized cities, such as Portland, OR, find that it works well for them. Over the years bi-partisan City Councils have, through open and transparent public debate (sometimes contentious, as democracy tends to be), improved and enhanced services while maintaining one of the lowest property tax-rates of any city in NYS. We have one of the most stellar municipal bond ratings in the country. We have achieved the highest score of any city in NYS in our recent review by the NYS Comptroller. Adoption of the proposed Charter, changing to a council-manager form of government, would require significant change management and will increase the costs of city government. Those who think it will lead to new day, a new beginning for the city haven’t been paying attention. Proponents of change claim it will lead to savings. I am skeptical – as Finance Commissioner I am very familiar with the costs of city government, and their numbers don’t add up. Savings will allegedly come from the elimination of Deputy Commissioners. Ignore for the moment if this is feasible, and note that, according to Paragraph 8.09.B, the proposed charter lets the City Manager decide whether or not to eliminate Deputies. Assuming such savings seems imprudent. The costs of the required new City Manager, Assistant City Manager and an Internal Auditor or additional audit firm (an unnecessary expense given our size) will cost the City roughly as much as the 5 Deputies currently do. Absent a Deputy Finance Commissioner we would need to create and fill a civil service, union Director of Budget Operations position, which will certainly cost us more than the current Deputy Finance Commissioner. The proposed charter almost triples the Mayor’s annual salary while reducing the work required of that position. It also adds 2 additional salaried Council members. So where are these savings? The Charter Commission have said health insurance is a material area of savings; their arguments misrepresent the actual costs involved by assuming all Council members elect the most expensive coverage possible, which is not the case now and has not been the case in recent history, but even so they could be addressed in far less draconian manner than changing our form of government. Proponents of this proposed charter claim it will create efficiencies by assigning job duties across City departments. This betrays a complete lack of knowledge of civil service and collective bargaining, while ignoring the monumental tasks and legal expenses of making this fantasy a reality. It is also based on a faulty premise. Job duties are specifically outlined and approved by the Civil Service Commission and the Council with an eye towards being as efficient as possible. Despite what you may hear from the Charter Commission, there is no duplication of effort across Departments, and we do not have employees sitting around doing nothing – far from it. Our Departments are streamlined; this is why our property tax rates are so low and so stable. The Commission continually states that we have 5 payroll departments, we have 1 and it sits in the Finance Department. They state that the Fire Department should not plow their own driveway, but of course they should as they need to be ready at any given moment to respond to an emergency call. These are just a few examples of the unrealistic cost-saving claims made by the Charter Commission. Regardless of the desirability of the proposed form of government relative to the current one, I am here to tell you that making this change – with this proposed charter – is not going to save the city and its taxpayers any money. It will increase costs. The next time you hear a proponent of change claim otherwise, please demand real concrete evidence as you make your decision before heading to the polls in November. Citing family demands the long time chair of the Saratoga Springs Democratic Party, Charlie Brown, has announced his decision to step down. He will remain a member of the party’s Executive Committee. In accordance with the committee’s by-laws Courtney DeLeonardis, who currently serves as vice chair, will assume the position as Chair. Ms. DeLeonardis is a teacher. She served on the city’s Ethics Board and is the wife of Vince DeLeonardis, the City Attorney. Brendan Lyons reported more dubious stuff involving the Saratoga County Republicans in the August 13th Times Union. Apparently the town of Milton supervisor, Daniel Lewza, was accused of sexually harassing his secretary and the town settled for an undisclosed amount. According to the story, the town went to great lengths to hide the complaint and subsequent settlement. As if this was not enough, apparently the town paid for a “politically connected” attorney (among other things he is the husband of Assemblywoman Mary Beth Walsh) to investigate leaks to the media about the controversy. This included sending letters to members of the town board warning them against disclosing the scandal. Earlier this month the New York State Comptroller released their semi-annual report on local sales tax, focused on the first six months of 2017. In this report, which was subsequently reported on by several local media outlets, it was noted that Saratoga Springs tax collections were down 5.9%, or approximately $319,000, year-over-year. While the report was technically correct, I wanted to address some concerns expressed both in City Hall and in the media. In terms of sales tax distributions received by the city, we have indeed received 5.9% less than we did as of the same period last year. This reduction was unexpected, and I ask all City Council members to be mindful of this shortcoming as we budget for the remainder of 2017. That said, as discussed during the July 18th Council meeting, the second quarter of 2017 was negatively impacted by over $545,000 of prior period adjustments wholly unrelated to 2017. Had these adjustments been accounted for correctly when they occurred, meaning in 2016 and 2015, City sales tax collection would actually be up over 4% for the first half of 2017, rather than down almost 6%. To support this analysis, we reached out to the New York State Department of Taxation and Finance to do a more detailed review of the City sales tax calculation. From June 2016 to May 2017, which is the most recent data available, the City collected $11.9 million from close to 13,000 businesses. As would be expected, the list of sales-tax-generating companies is fairly top heavy, with 92 businesses generating half the City’s annual total, and the top 20 companies accounting for almost 25%. This top 20 represent a diversified pool of industries including hospitality, retail, tech, construction, and automotive companies, and in total this group was up over 13% combined year-over-year. Additionally, of this top 20, 17 were in the top 20 last year. We believe this combination of strong growth and consistency at the top of the list reflects well on the overall economic health of the City, and bodes well for the future. One sales tax-related article I wanted to mention specifically was in The Saratogian on August 4th, in which the sales tax decrease was attributed by one resident to “low gas prices” and “reduced construction activity in the City” compared to surrounding areas. While gasoline prices remain relatively low historically, I will note that the average price per-gallon has been higher every month in 2017 when compared to the same period in 2016, per the U.S. Department of Energy. In relation to the quote about City-wide construction activity, while we don’t get State data at an industry level, I would caution all outside observers from painting with too broad a brush. A deeper dive into the numbers showed us that some construction-related businesses were in fact down, while others were actually up year over year. Furthermore, the impact of construction on the City’s sales tax total is unclear, given the uncertainty around where a builder might purchase their raw materials. What I can say is that based on all the information we have, the City of Saratoga Springs appears to be economically growing. Overall, the $11.9 million received from June 2016 to May 2017 was 4.4% greater than the amount received from June 2015 to May 2016. To reference back to the initial Comptroller report, if you exclude the aforementioned prior period adjustments, City sales tax collection would be up 4.2% for the first half of 2017, which is better than the State-wide average (+3.4%) and stacks favorable against several nearby communities, including Albany (-1.5%), Washington (+0.7%), Warren (+1.6%), and Fulton (+2.4%). Again, we’re aware of the negative impact of prior period adjustments on 2017 sales tax collections and we will budget accordingly, but overall we believe our analysis shows just how strong the City economy actually is. I’ll continue to update the Council as we receive future sales tax distributions and reports. What may (or not) be this election season’s latest issue is officially known as the Geyser Road – Spa State Park Bicycle Pedestrian Trail. As currently proposed, the paved path would follow a route parallel to Geyser Road from the Milton town line, just east of Rowland Street, to the Avenue of Pines. At the western end, this would connect trails in the town of Milton, and beyond, to trails in the Saratoga Spa State Park at the eastern end. In turn, the latter would link to the existing and proposed Greenbelt trails encircling the city. The Spa Park trails were recently extended to the Railroad Run trail that begins in downtown Saratoga Springs, so that ultimately one would be able to travel by bike or foot between the outer districts and downtown on a safe byway, isolated from motor vehicle traffic. At a hearing before the City Council on August 1st, residents spoke for and against the existing proposal, which has been in the works in various forms since 2005. Adding to the mix was a recent offer from the Slack Chemical Co. and its neighbor, beverage distributor Saratoga Eagle, both owners of wooded lands roughly three-quarters of a mile west of Geyser Road. They offered to donate land to the city for free so that the trail could wind through this otherwise vacant parcel, saving the city from acquiring land along the currently proposed right-of-away. Although some conceptual maps were on display as part of project engineer Peter Faith’s opening presentation, one of the problems I had in evaluating the pros and cons was the absence of published maps delineating the various schemes. So, based on the presentation, I came up with the map below. The city’s current proposal is the Red Route and one concepts for the Slack/Eagle alternative is the Green Route. The Red Route has been under consideration since 2005 and has a total budget of about $3 million, mostly funded by state and federal grants. 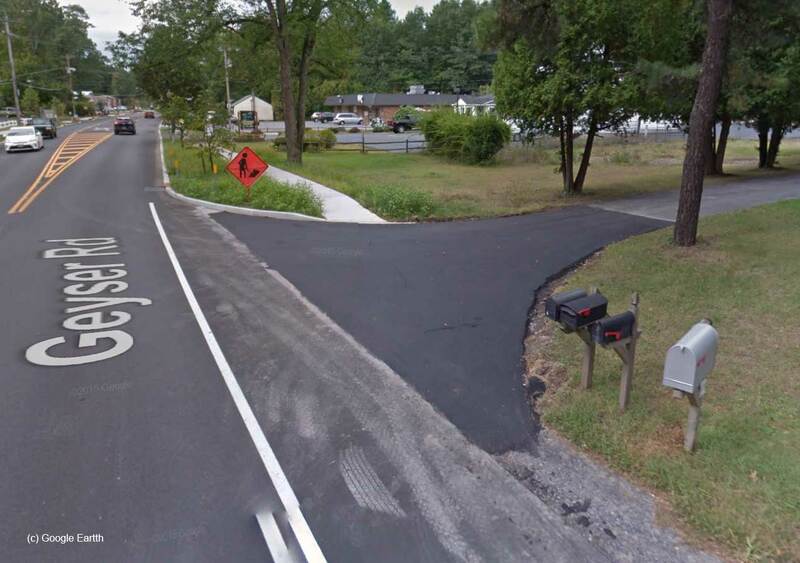 In addition to the trail, these funds would improve the intersection of Geyser Road and Route 50, which the trail would cross to join the existing path, which continues parallel to the Avenue of the Pines. The nationwide financial crisis of 2008-2009 put this and many other infrastructure projects on the back burner for a few years, so along with the economic recovery, came the incentive to finish this trail, with a target of 2018. 1. The Geyser Road bridge over the railway was recently rebuilt to include accommodation for pedestrians and bicycles on the north side. The alternate Green Route would require a new bridge, not only over the rail line, but over Geyser Creek, as well, pushing costs up another $1 million or so. This is to say nothing of the need for new engineering and environmental impact studies, especially since it’s been reported that the Karner Blue butterfly lives in these woods and that there’s a wide swath of wetlands in those lands, to boot. 2. The alternate proposal would still fail accomplish the primary goal of a continuous path from the Milton town line to the Spa State Park. Let me add that at twice the length of the Red Trail along Geyser Road, the cost of the Green Trail, including additional grading, paving, and a bridge or tunnel, would turn this into a $6 million project and push it back another three to five years. While the hearing was specifically called to discuss the issue of eminent domain in pursuit of an unbroken right-of-way, many residents and one business owner from the Geyser Road area spoke in favor of the project. Currently, there is no continuous sidewalk along the road and the paved shoulder is too narrow for even a vehicle to pull over. Most speakers favored the major objective of providing a direct, safe pathway for biking and walking from the local neighborhoods to and from the Geyser Road Elementary School, the adjacent local park, the Spa State Park and, ultimately, downtown Saratoga. One resident pointed out that even if the alternate route were to be built, kids would still walk or bike down the much shorter (and much more dangerous) Geyser Road shoulder. Although residents on the south side of Geyser Road generally favored the plan, Jack Pompay, one of the opponents who spoke at the hearing, lives on the north side of the road and, as shown on a chart presented by Mr. Faith, is one of four private property owners whose land would be needed to complete the project. Mayor John Romano of Ballston Spa, which owns a nearby reservoir situated on a parcel with frontage on Geyser Road, raised several objections, as well. To be perfectly clear, the city’s claim would be limited to frontage along the road, perhaps 8 or 10 feet deep, and not target entire properties. Most of the parcels subject to this action include structures set far enough back from the road as to be be unaffected. The net change has more to do with relocating landscaping features, such as the scrubs and fencing, than relocating or displacing families. Mr. Pompay lives at 111 Geyser Road and, as you can see from photos excerpted from Google Earth, the right-of-way would necessitate removing or moving the mature shrubbery that borders his front yard. As a point of fact, Mr. Pompay would stand to loose 0.09 acres of a parcel that totals 7.83 acres. That’s less than 1/10th of an acre. The other private property owners are Munter Land Holdings LLC (they would loose 0.04 acres out of 45.83 acres of vacant land), Van Hall Holdings LLC (0.07 acres out of 3.58 acres of vacant land), and the Saratoga Springwater Co. (0.6 acres out of 46.6 acres). Thomas Harrington, Jr, who owns 159 Geyser Road, had concerns about how much of his property, if any, would be taken, but he was not on the list presented by Mr. Faith. Neither was the property at 119 Geyser Road, right next to Mr. Pompay’s, though it would seem that strips of both parcels would be necessary to complete the trail. In 2005, the principle of property owner’s absolute right to their land was struck down by the US Supreme Court in a Connecticut case known as Kelo v. City of New London. Like it or not, a claim of eminent domain in the furtherance of development is perfectly legal. Despite this, Amanda Jackson, an attorney with the law firm of Harris Beach announced that she was representing both Mr. Pompay and the Saratoga Springwater Co. and would oppose any attempt to claim eminent domain over their respective properties in court. Dave Morris, a commentator well known to readers of this blog, also came forward to denounce the process and served notice that two Geyser Road property owners, whom he did not name, also planned to sue the city over eminent domain. He took a very aggressive stance and claimed that two of the city council members, also unnamed, had privately admitted to him that they thought the Red Trail had safety concerns due to its proximity to the very busy thoroughfare, an argument used by everyone who spoke against it. Although he did not mention his exact residence before addressing the council, there is a David Morris who lives on Tamarack Trail in the Geyser Crest development, off the south side of Geyser Road. His property would be unaffected. 1. The appraiser, who was hired to evaluate the proposed parcel buy-outs, apparently lacked certain diplomatic skills and offended land owners with both his manners and his math. 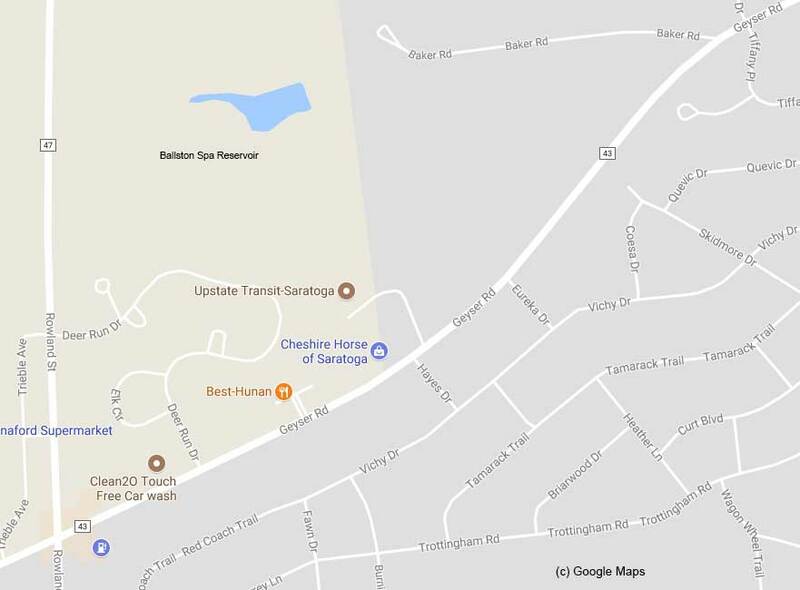 To illustrate this point, Mayor Romano mentioned that Ballston Spa was offered a mere $1,800 for about 1/4 of an acre of prime road frontage. This, after being threatened with an eminent domain action before there was even an opportunity to negotiate, among other insults. 2. We know from his posts elsewhere on this blog that Dave Morris despises Mayor Yepsen, who backs the trail, as proposed, along Geyser Road. 3. Deep Woods alleged that Adam Madkour, the CEO of the Saratoga Springwater Co., is an extreme conservative who also despises Mayor Yepsen and is also thought to be the financial backer of the proposed lawsuits against the city’s eminent domain actions, including one by Mr. Pompay (Ms. Jackson pretty much confirmed this). 4. Saratoga Springs Republican supervisor candidate John Safford spoke up, as well, and urged the city to delay action until it had more thoroughly considered the proposal by Saratoga Eagle and Slack Chemical. He was defeated for mayor by Yepsen in 2015 and was also the recipient of campaign donations from Jeff Vukelic, the president of Saratoga Eagle. Frankly, it looks like the principal objections are coming from individuals who are out to embarrass the mayor over a project that she’s promoted and worked to advance for the past several years. But what’s the point? She’s not running for re-election, the Geyser Road Trail was initiated by her predecessor and will be certainly by inaugurated by her successor, so why gang up on her now? I’m not a big believer in conspiracies, but there seems to be some sort of political mischief at work here, if only by coincidence. If I may further editorialize, the safety objections are superfluous. Mayor Romano suggested that increased foot traffic would lead kids to stray from the path, go into the woods and then into the reservoir, where they might drown. Of course, they could do that now and what would stop them? The whole point of the path is to increase safety for bikers and hikers, as attested to by many of the speakers. If there is a genuine need for additional safety measures, then put a low fence or bollards between the path and the road. Should conditions call for it, this can always be done retroactively. Rather than waste money on a legal dispute that it’s likely to win, anyway, the city should negotiate a reasonable price with Ballston Spa, put a fence around the reservoir to limit their liability (why isn’t it there now? ), and apologize for the appraiser’s ill-mannered treatment of the mayor. It should take the same action with the property owners. Offer them a generous settlement, relocate their fences and shrubs, and agree to a year’s worth of maintenance in order to guarantee restoration of the landscaping to its original appearance. The next hearing will be this Tuesday, August 15, and the public is invited to submit additional comments, after which the comment period will end. If you’re really passionate about this, don’t just comment here — tell it to the City Council where the vote to proceed, modify, or delay will take place. For additional insight, a LookTV video of the August 1st City Council meeting can be viewed on YouTube http://www.looktvonline.com/saratoga-council-meeting-8-1-17/. This particular discussion begins at marker 8:08:00. If you’re curious to see and hear Dave Morris in action, he comes in at marker 1:27:25.